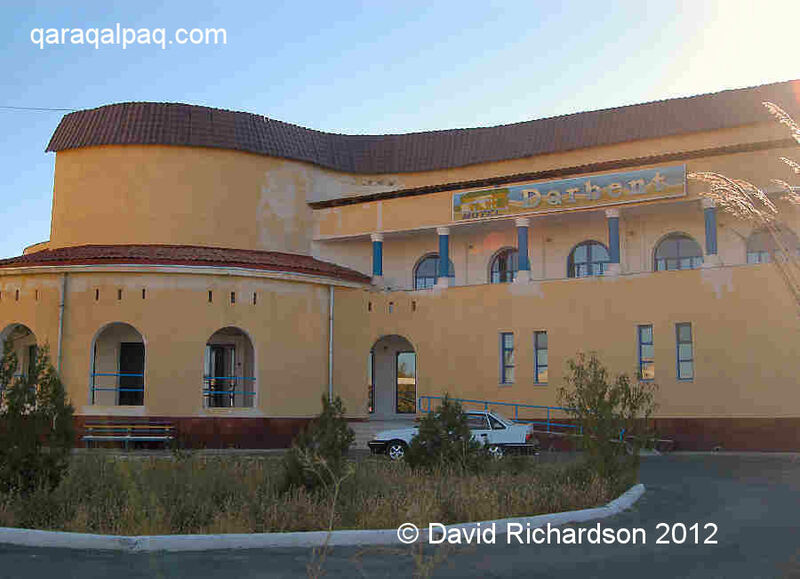 Uzbektourism includes a plan for building a world-class hotel in No'kis among its proposals for foreign investment up to 2010. The likelihood of this actually happening seems rather remote to us. 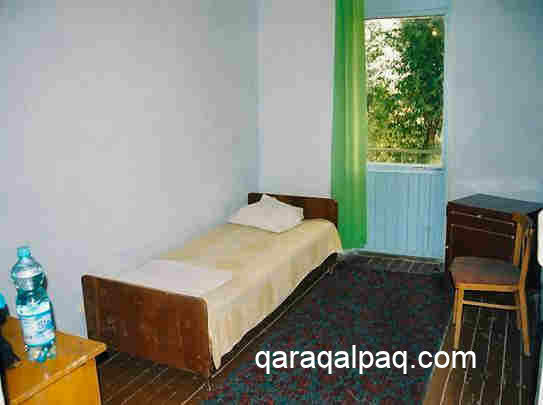 At the moment those wishing to spend some time in Qaraqalpaqstan have a rather limited choice of lower-standard local hotels. As there are so few rooms of reasonable quality available you are advised to book ahead. It is important to note that the situation can change rapidly, new places open up and ones that were of a good standard can suffer from a lack of maintenance. The information below was correct in October 2011. Prices given are rack rates for the tourist season in dollars and include breakfast. Obviously if you are travelling out of the main tourist season you can expect a discount on these prices. For the location of the central hotels check out our map of Downtown No'kis. Throughout Uzbekistan hotel and guesthouse pillows can be hard and lumpy, while sheets can be rough. We always travel with our own pillows, sheets, and lightweight camping thermal covers. You can buy decent pillows in the West for a couple of dollars. On your departure leave them with a local family who will be grateful for them. The Jipek Joli is probably the best place to stay in town at the moment. It is in an excellent location just 60 metres from the Savitsky Museum. 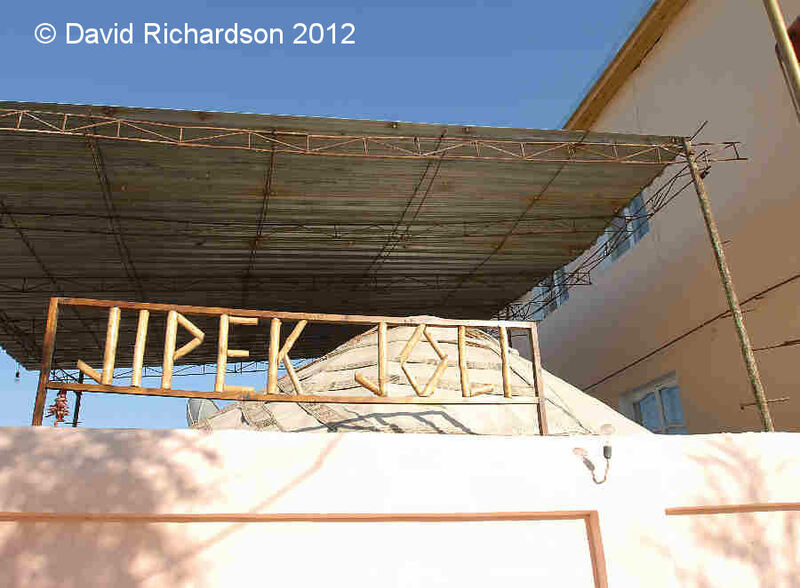 Exterior of the Jipek Joli Hotel. Bedroom in the Jipek Joli Hotel. The hotel has 15 rooms, 7 of which it classes as deluxe, 4 as semi-luxe and 4 as standard. The deluxe rooms are bigger than the semi-luxe, but both have private facilities. Standard rooms share a bath and toilet between two rooms. All rooms have air-conditioning and are clean with comfortable beds and satellite TV. The electricity and water supply are reliable, although there is not much hot water. The receptionist has quite good English skills and other members of staff have a smattering of English. It seems a friendly place where the staff are willing to help you. There is a computer in the reception area for the use of guests at a cost of $2 per hour but apparently it only works intermittently. Dining room in the Jipek Joli Hotel. Lunch is available at a cost of $10 and dinner for $6 but it must be pre-ordered. However there are many cafes nearby. The hotel is able to organize a wide variety of excursions. You could probably get them cheaper from taxi drivers if you bargain hard but you may want the reassurance that it is all pre-booked if you are only in No'kis for a couple of days. Azatbek is a young guide who works from the hotel and has excellent English. On 17 September 2011 the Jipek Joli announced that it will be opening a new three-storey residence in 2012 containing eighteen rooms. This very Russian-looking three-storey hotel is owned and run by a local family. The hotel is very centrally located and faces a large car park where taxi drivers congregate. The Central Post Office and the State Museum of Art named after Savitskiy are within easy walking distance. It has 35 rooms - 18 twin-bedded rooms, 15 triple rooms, and 2 apartment suites. The rooms are clean but dull and rather spartan with small beds. They have bathrooms, air conditioning, and satellite TV. Cold water is always available but hot water is less reliable. Room furniture and bathroom fittings are all a bit old and tired. Twin bedded rooms cost $20-30 and apartments sleeping 3-4 cost $60 per night. A bedroom at the No'kis Hotel. It is frequently used by tour groups. 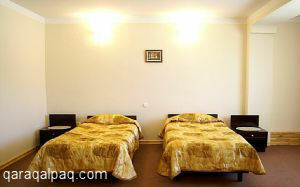 It is certainly better than the old Hotel Tashkent, but you would not want to stay here for too long. It is mainly designed to cater for local people rather than Western visitors. Service can be slow and none of the staff speak English. One positive feature in a town with almost minimal nightlife is that it has a busy bar selling draft beer, red wine (Mona Lisa), and liquors, which is open at lunchtime and in the evenings until 11pm. The restaurant serves good goulash and French fries. This is owned by the family who run the Hotel No'kis and is used by small tour groups. However, with a trip of about 3 km to the city centre, guests need to have their own transport. The exterior of the Darbent Motel. Bedroom at the Darbent Motel. 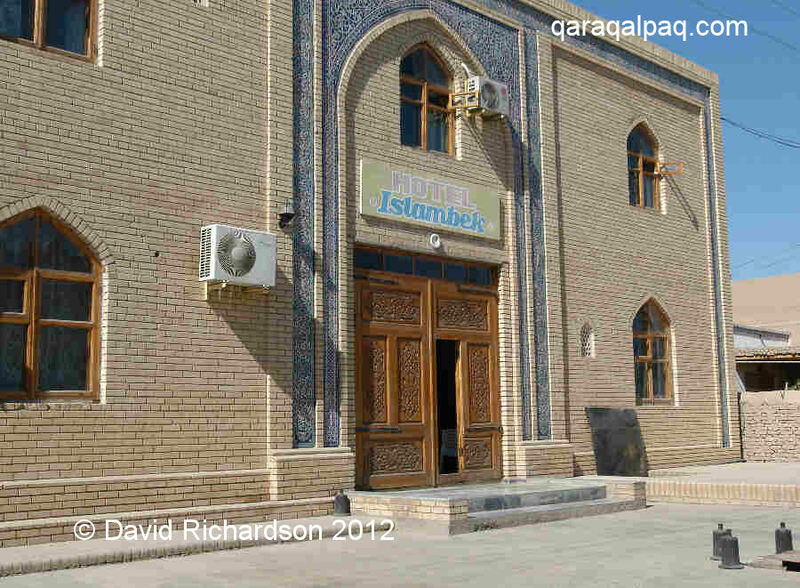 It is located next to a filling station on the A380, the main Bukhara to No'kis road, just on the outskirts of the city and opposite the site of the old Katex factory. It sits back from the road behind railings and has a large and secure parking area. The two-storey hotel was only constructed in 2004. It has just 7 double and 5 single rooms. 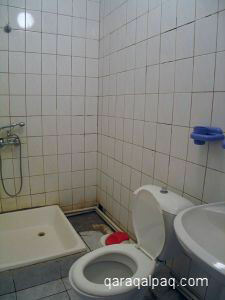 A bathroom at the Darbent Motel. The double rooms are each equipped with TV and refrigerator. The rooms facing the afternoon sun can become unbearably hot. Prices in November 2007 were $30 for a single room and $40 for a double. Despite its recent construction it already looks scruffy and neglected, with an unkempt garden and paint peeling off the exterior. Friends of ours who have stayed here are not very complimentary about their experience. The only four-star hotel in No'kis the relatively new Rahnamo Hotel has ten twin rooms, three single rooms, and is air-conditioned and non-smoking. Rooms have cable TV and telephone and there is a first-floor breakfast room, small meeting room that can accommodate eight, a fitness room and sauna offering a massage service. The exterior of the Rahnamo Hotel. Twin bedded room at the Rahnamo Hotel. 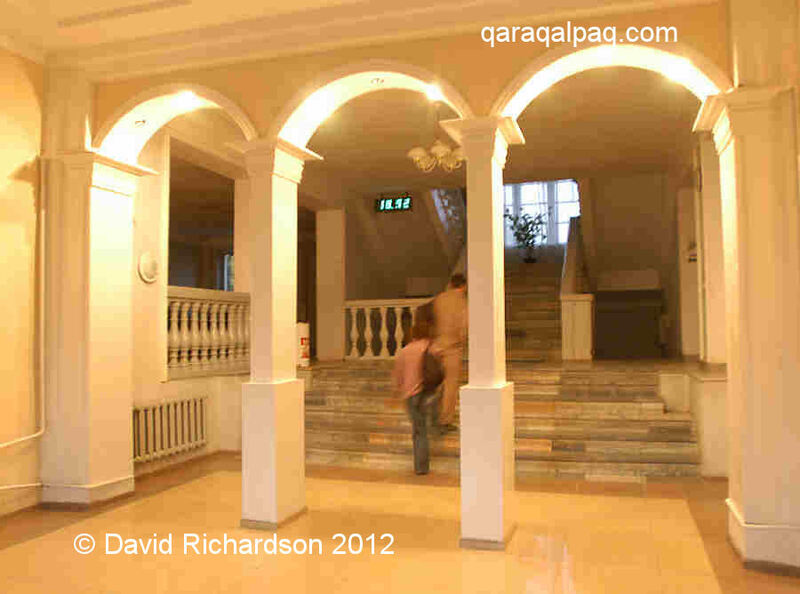 Rahnamo Hotel, 4 Qaraqalpaqstan, 230100, No'kis. The hotel hopes to set up its own website soon. It can be booked through travel agents in Tashkent. It is used by NGOs such as the United Nations. The latest private guest house in No'kis, the Kizil-Kum is a simple place located just outside the central downtown area. Room rates, including breakfast, are $50 for a standard double up to $80 for a deluxe double. Singles range from $30 for a standard to $50 for deluxe. Rooms have satellite TV, en suite bathrooms, hot water, wardrobes, and lockers. 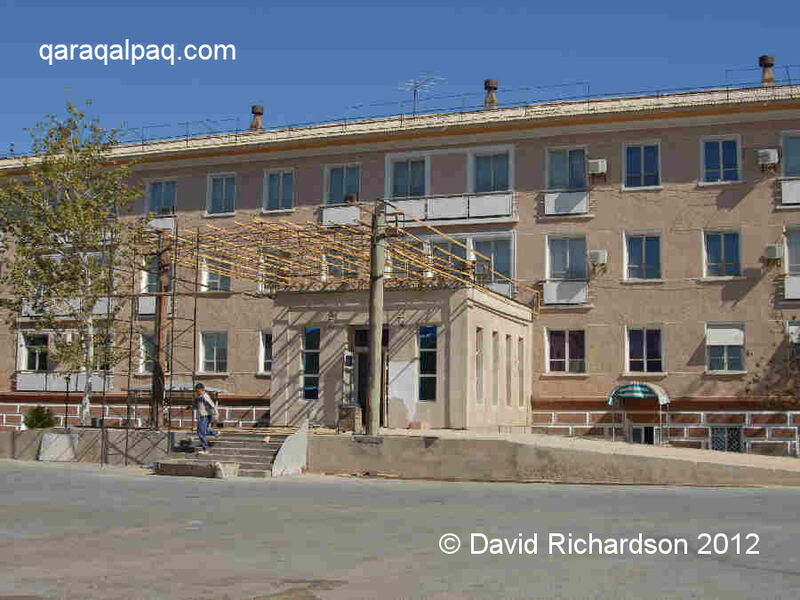 Kizil-Kum Hotel, Utepova Street, No'kis. Tel: (+998 61) 223 00 64, fax: (+998 61) 223 40 89, mobile: (+998 93) 614 51 00. There is a small courtyard with a separate sauna and an extensive garden and a patio. There is also a separate conference room for hire. We have just found out about this new accommodation so have not yet had the chance to check it out. The exterior of the ARZ 16 Hotel. Bedroom at the ARZ 16 Hotel. ARZ 16 Hotel, 1 Dostliq Guzari 173. This can be booked through Advantour. Its facilities include air conditioning, a decent bathroom, satellite TV, and a fridge. The lounge of the ARZ 16 Hotel. Rooms cost $35 for a single and $50 for a double. Not far from the Darbent at the southern end of To'rtku'l ko'shesi this huge monstrosity has been under construction since 2002 but has still not yet opened for business. Locals claim that it is intended to accommodate long-distance truck and other drivers, although it seems rather over ornate for a such a clientele. The White Swan is a government-owned guest house located to the east of the Qızketken Canal beside a small lake with its own tiny island. It has about 12 double rooms on two storeys and in the past has been made available to small tour groups. This was an attractive option when the only other choice in town was the Hotel Tashkent, but today there are several better options. If all of these options are full the Director of the Savitsky Museum, Marinika Babanazarova, can sometimes arrange a homestay with a local family. This can range from a room in a family home to the use of a whole apartment. Meals can also often be provided. We thoroughly recommend a local homestay for anyone staying in No'kis for more than a few days. 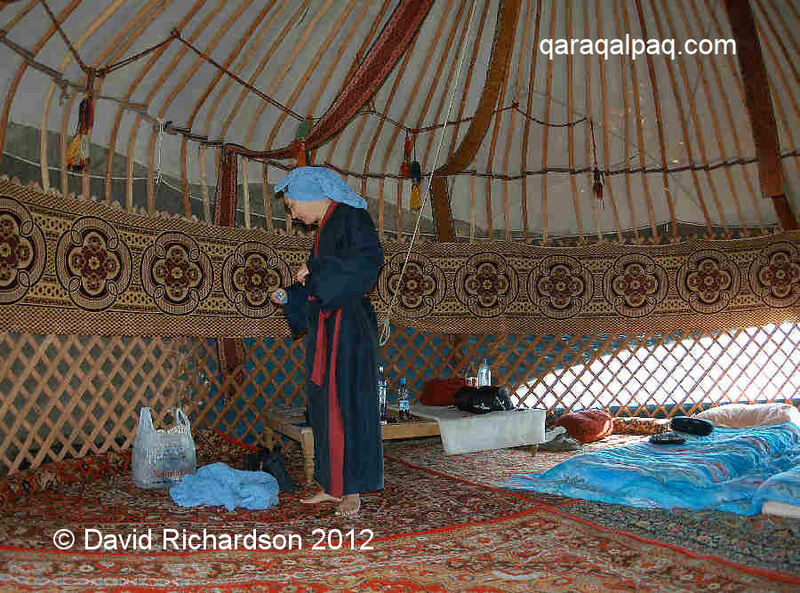 This is a great way to meet local people and to find out about real life in Qaraqalpaqstan. Often home-cooked food is better than that available in restaurants. The downside is that you waste half a day trying to register with OVIR. 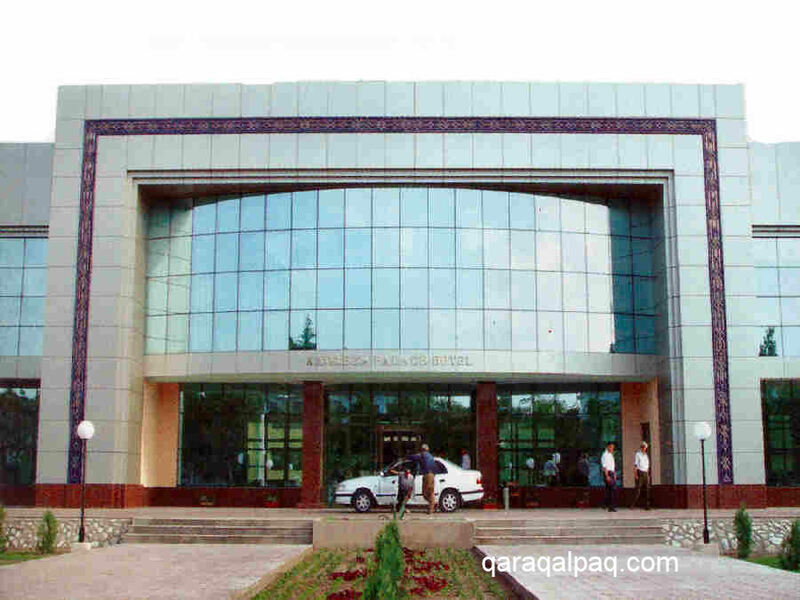 If you are staying in Uzbekistan for longer than 72 hours and are not in a hotel you need to register with OVIR (Office of Visas and Registration). "Foreign Exit-Arrival and Nationality Office". If you are staying in a hotel they will ask you for your passport at check-in, retain it for a short period, complete the registration paperwork and return your passport to you. However if you are staying in a private house you, along with your host, must personally register with the local district OVIR office. This pleasure will cost you $20 each and can take half a day to complete as you are directed back and forth to different departments, a public notary, and the Paxta Bank. At least it provides you with an interesting insight into the bureaucratic legacy left behind by the Soviets! OVIR officers can be eager to track down foreigners who are slow to register, as the fines administered generate a good source of income - all Uzbek government departments are encouraged to be self-funding wherever possible. Those caught without registration have to pay a fine, the amount of which is determined by OVIR according to the seriousness of the offence they consider you to have committed (normally around the $100 mark), plus the normal registration fee. If you travel to another city and plan to stay for longer than three days, you will need to register again there. 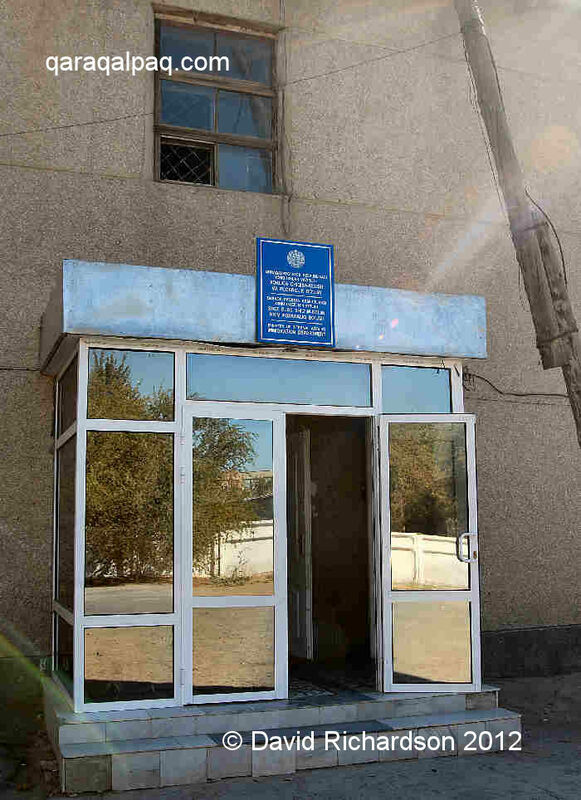 The OVIR office is located on Rashidov ko'shesi. To get there from the Savitsky Museum walk down Rzaev and turn left onto Rashidov. Go across Dosliq Guzari and then across Dosnazarov. 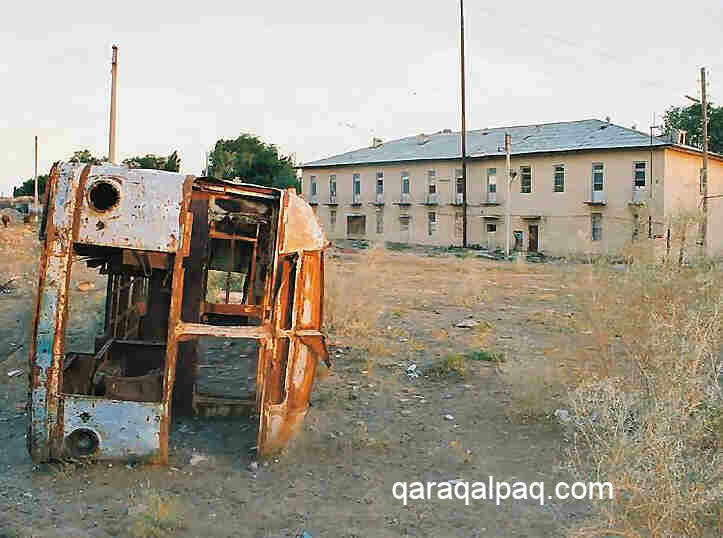 The OVIR office is two blocks further, on the right hand side of the road, just in front of the prison. It is a 2-storey building and the OVIR office is on the second floor. Unfortunately the Oybek is the only hotel in town. 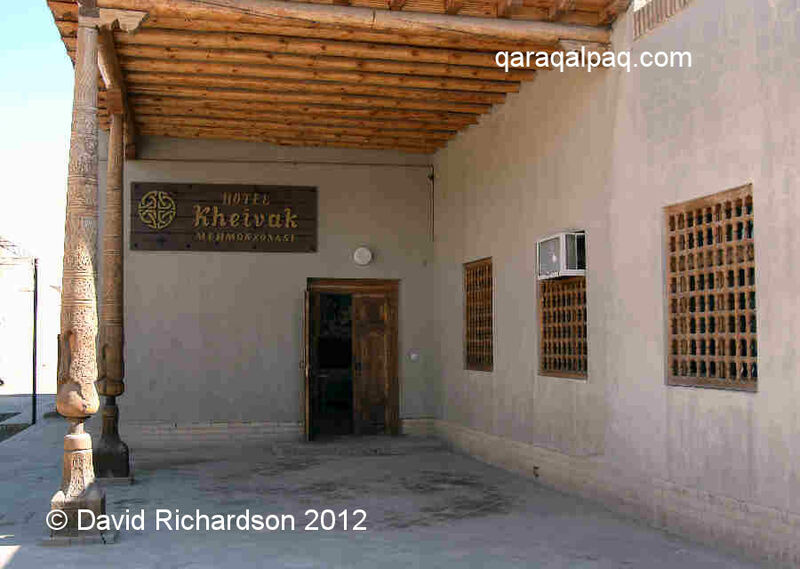 The Hotel Oybek, Moynaq. Image courtesy of Johan Rehn. Hotel Oybek (8361) 322 1868. If travelling to Moynaq by bus do not get off at the bus station but stay on the bus until it reaches the cinema. The hotel is 100 metres away on the right side of the road behind a white 2-storey police station. Rooms cost around 4500 so'm per person without breakfast. Apparently you need to bargain hard. It has a pit toilet outside and you can get water from a hose for washing. We have never stayed here but have been reliably informed that the rooms are small and basic with shared bathrooms. Mosquitoes can be a problem and there are no fans in the rooms. A room in the Hotel Oybeg. Image courtesy of Johan Rehn. It is also possible to arrange a homestay through the curator of the Moynaq museum, but the problem is that this museum is often closed. It is probably better to hire a taxi and visit Moynaq as a day trip from No'kis. If you are setting off for a trip to the Aral Sea itself it is better to take camping gear with you. 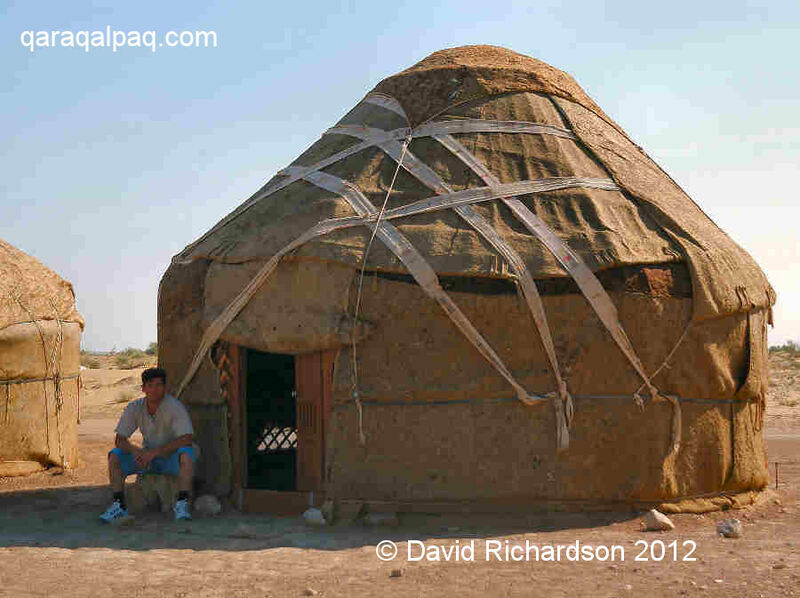 If you have time it really is worth staying overnight at the Ayaz yurt camp on the way from Khiva to No'kis. The Yurt camp at Ayaz qala. The camp is on a ridge 15 minutes walk from Ayaz qala with great views over the surrounding countryside. 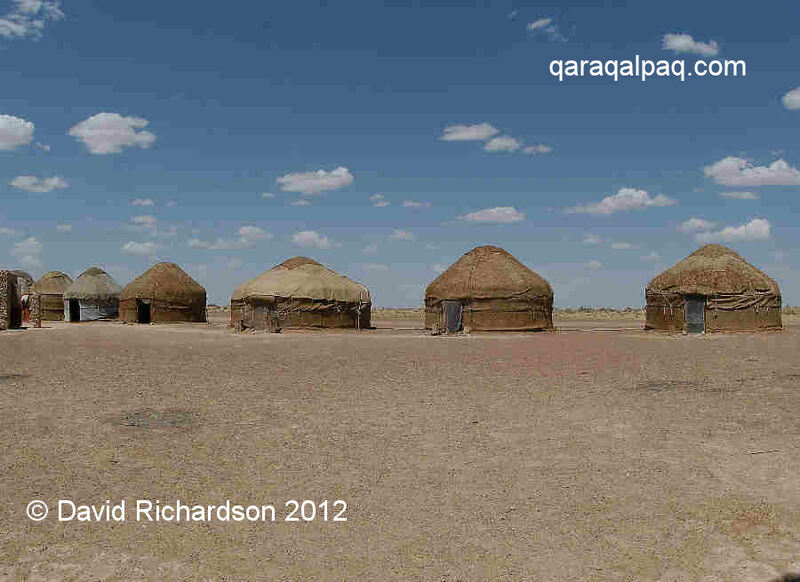 Accommodation is in spacious traditional Qazaq and Qaraqalpaq yurts. The yurt camp is run by an energetic Qaraqalpaq woman and her staff work hard to provide attentive service to guests. It costs $30 per night per person, including breakfast, lunch, and dinner. It is possible to purchase cold beer, wine, and vodka at the camp. You can email the owners at ayazkala@newmail.ru or telephone them on (8361) 532 43 61. However it is probably easier to book it through an Uzbek travel agent or through the tourist information centre in Khiva (opposite the Kalta Minor). Alternatively you could just have lunch there, but again this does need to be booked in advance. There are two shower cabins with hot water from solar panels and two Western-style toilets. There is an outside covered platform for lazing in the daytime or dining under the stars. Traditional bedrolls, quilts, and pillows are supplied. A torch is a good idea. The yurts can be hot in summer. One drawback of the camp is that it seems to attract mosquitoes so ensure you keep covered up. Camel riding can be arranged for $5 or you could hike 2 miles down to the lake for a dip. Obviously the main attraction of the camp is its proximity to the fabulous ancient qalas. You can easily walk up to the top of Ayaz qala 1 and back before breakfast. Inside one of the Ayaz qala yurts. This yurt camp is popular with tour groups so advance booking is essential in the height of the season but you may well be lucky and have it almost to yourself. 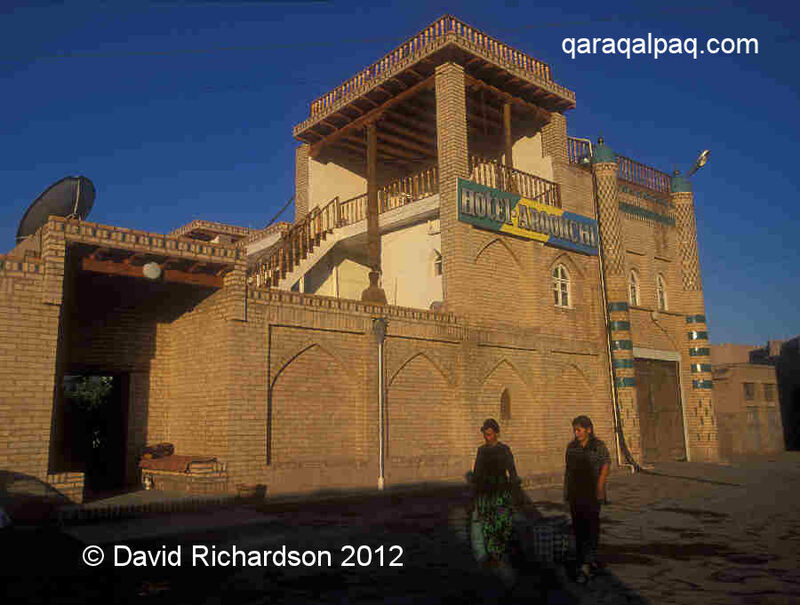 Unfortunately if you are really interested in visiting more of the ancient qalas there is no other accommodation available on the right bank of the Amu Darya. The best option for cutting down the amount of time spent travelling to the sites is to stay in Urgench. There are no cheap B & B's here. 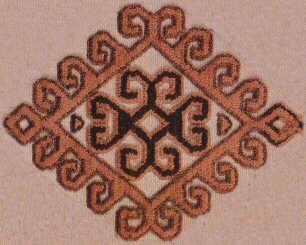 You have the choice of the Jayhun, which did have a poor reputation but has recently been renovated, or the Khorezm Palace. 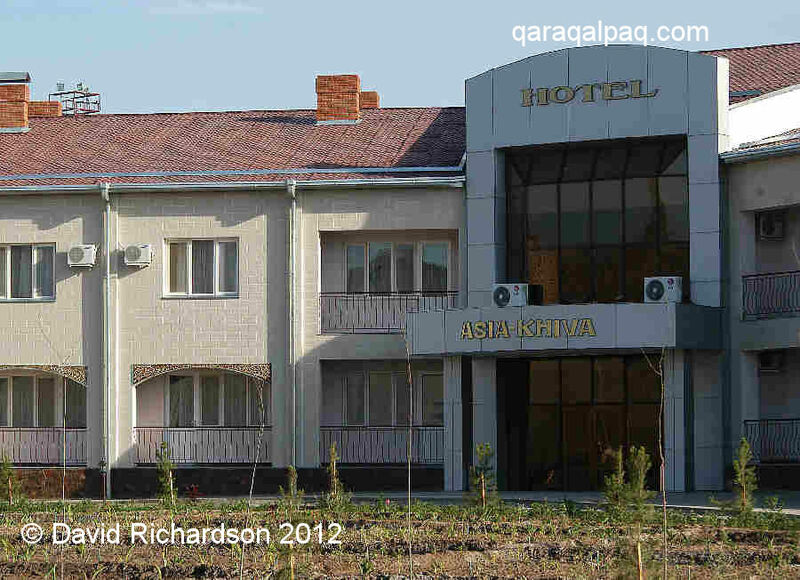 This modern hotel is only 5 minutes drive from Urgench airport. 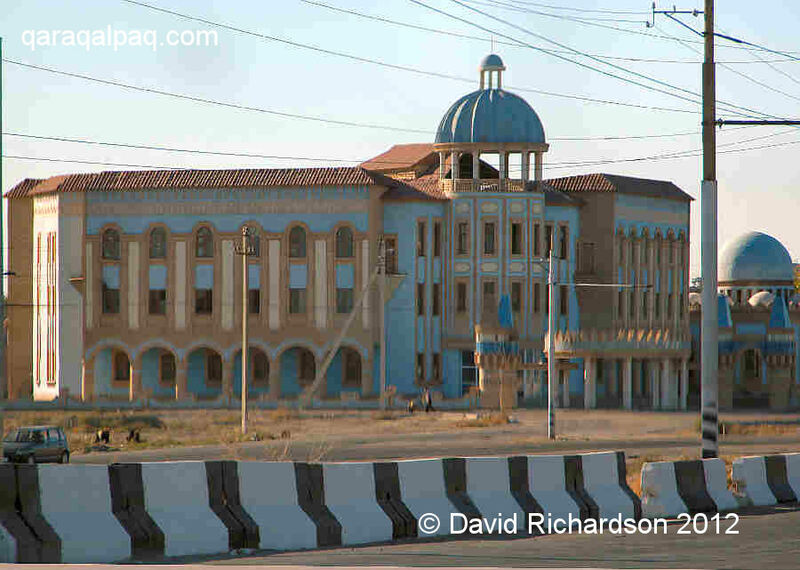 Exterior of the Khorezm Palace Hotel. 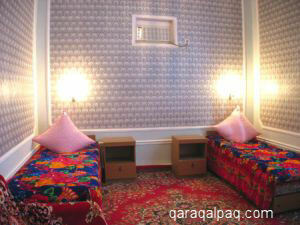 Bedroom of the Khorezm Palace Hotel. It has a range of facilities including a large swimming pool, sauna, tennis court etc. Rooms cost $80 for a single and $95 for a double. Many tourists will combine a visit to Qaraqalpaqstan with a visit to Khiva. 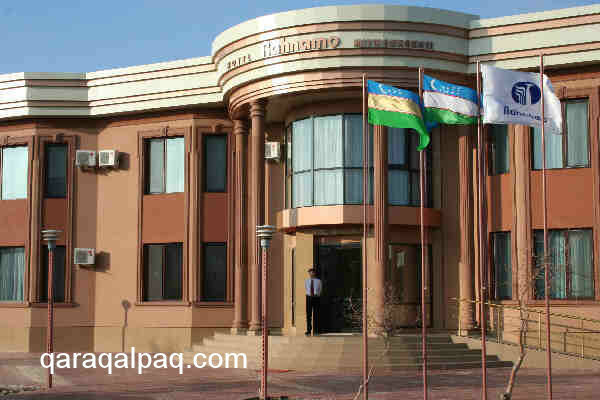 Indeed if good quality hotel accommodation is really important you could just make a brief 1 day visit to No'kis while staying in Khiva as it is only about 2 hours away by car. However we obviously feel you would miss out on the real Qaraqalpaqstan that way. Urgench airport is 40 minutes drive from Khiva and a taxi from the airport to Khiva old town should be around 2500 so'm per person. You may also be able to arrange a pick-up through your hotel. 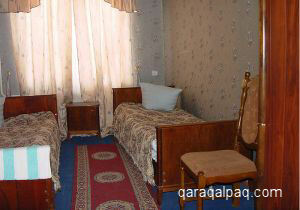 There is a large choice of accommodation available in Khiva. The better quality hotels, such as the Malika Khorezm and the Asia, are just outside the gates of the old city. However although both of these hotels have good facilities they are lacking in character and you could be staying anywhere in the world. This is a modern hotel with spacious rooms, comfortable beds, and excellent bathrooms. Exterior of the Malika Khorezm. Bedroom of the Malika Khorezm. Rooms cost $45 for a single and $60 for a double. They can arrange day trips to their yurt camp by a river where you can swim and relax. 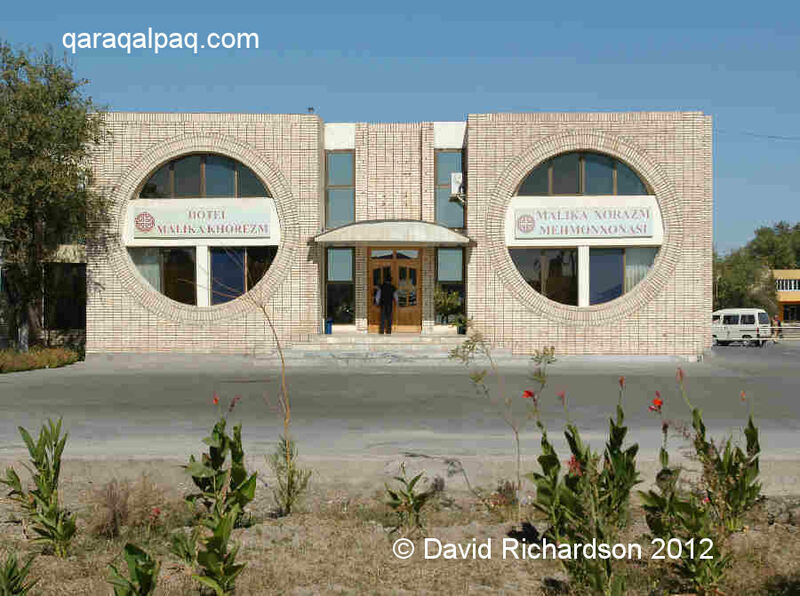 This is another modern hotel located just outside the walls of the Ichan Qala. Those visiting in the summer will really appreciate the excellent air-con and the swimming pool! One building dates from 2004 and the other was added in 2007. Rooms cost $55 for a single and $75 for a double in the tourist season. This hotel was built in 2002 and opened as the Lola. It was recently taken over by the Malika Group and renamed the Malika Kheivak. We stayed in this hotel in 2003 and again in 2004. It was depressing to see the results of the lack of maintenance in that short period. We assume that the new owners have renovated it to the same standards as their other hotels in Khiva as they are charging $50 for a single room and $70 for a double. It is in an excellent position in the heart of the old town right by the minaret. This business run by Sobir Khasanov and his family has been welcoming guests to Khiva since 1992. It got its name (sometimes spelt Arqonchi) from the former trade of its founder who was a rope-maker. At one time this used to be the only place to stay in town (apart from the horrible medresseh) but it has been somewhat overtaken by the smaller more personal B & B's that are currently opening. It can now feel as though there is too much emphasis on tour groups but it is still a great place to meet people and the food in the cavernous restaurant is pretty good too. The upstairs decks have super views over the city. Rooms cost $25 for a single and $35 for a double. Several enterprising locals are establishing good quality B & B's and the situation is constantly changing, so ask around. We have stayed in this family run B & B near the Ark and found it to be very well run. To reach it from the Northern Gate or Bakcha Darvaza, take the first street immediately on your right and walk straight on. It is the very last house on the left before reaching the Kunya Ark. Guests have access to a roof terrace with great views over the old city. 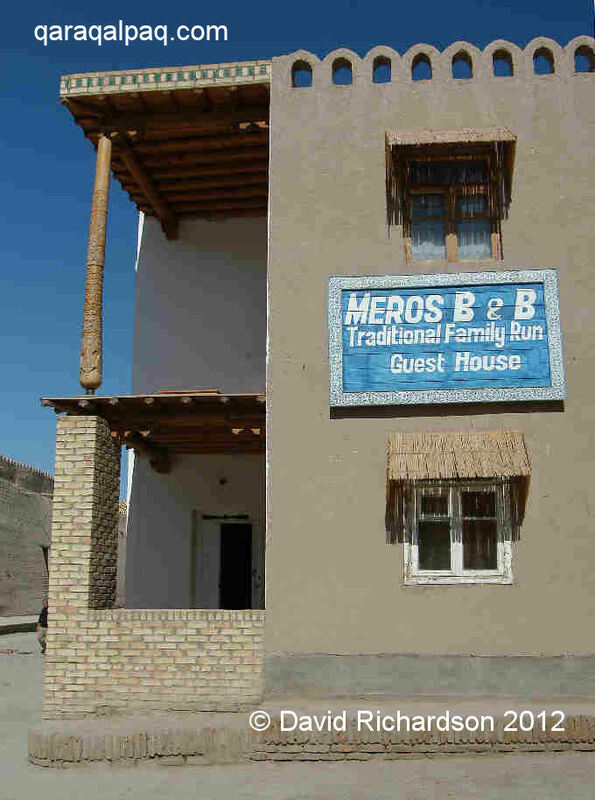 Meros means "cultural heritage". The owner of the B & B, Corombeg, is the chief restorer of the decorated ceilings in Khiva and you can see an example of his work in the dining room. His wife, Zulhamar, has had plenty of practise cooking for vegetarians as they hosted a vegetarian volunteer from Operation Mercy for 6 years. Rooms are around $15 with just breakfast, or $20 including 3 meals per day. This is probably the best B & B in the Ichan qala at the moment. Although we have not stayed here we have been reliably informed that the accommodation at the Islambek Hotel is of good quality. Exterior of the Islambek Hotel. Bedroom of the Islambek Hotel. 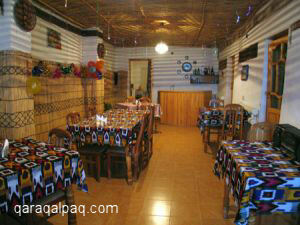 It is near to the Tash Hauli Palace and has large clean rooms with air conditioning. The son of the owner speaks some English. Rooms are $25 for a single and $40 for a double. The tourist information centre near the Kalta Minor can help with all accommodation and travel queries. This page was first published on 1 April 2008. It was last updated on 1 March 2012.